This Sunday (September 28, 2014), at 8:30pm (doors: 8:15pm): Han-earl Park (guitar), Roslyn Steer (bass), Dan Walsh (drums) and Tony O’Connor (bass) plus very special guest Caroline Pugh (voice) perform Upstairs at The Roundy (Castle Street, Cork, Ireland) [map…]. Admission is one euro note of your choice (€5/10/20…) at the door. Thanks to Catherine Kirby and everyone at the National Concert Hall for able and professional assistance, to John Godfrey, Juniper Hill and Melanie L. Marshall, the then coordinators of the UCC Music Research Seminar Series, who strongly supported Wadada’s visit, and to Mary Hickson, Chris Gaughan, Peter Crudge, Eoin Winning and everyone at the Cork Opera House. Kudos to Tony O’Connor and Athos Tsiopani for the behind-the-scenes help, and to John Hough for the videography and the technical support. Thanks also to Carmel Daly and Mel Mercier of UCC School of Music; Gary Sheehan of Note Productions; Jeffrey Weeter, Paul O’Donnell and, formerly, Jesse Ronneau of the UCC Concerts Committee; and Andreas W. Ziemons, Niamh Ryan and Louise Walsh at Music Network. Thanks to David Leikam of the Arts Noticed, Linda Plover of Blue Monkey PR, Eoin Brady and Bernard Clarke of Nova, and Sandra Quinn at the Evening Echo for their support. A big thank to the best sound engineer in the world, Alex Fiennes, for amplifying the Cork event, and making the performance sound its best! and to Melanie for the conversations and unofficial roadie duties. Kudos to Marian Murray for jumping into the deep end, a special note of thanks Paul G. Smyth for stepping-up to support this project, and to Dennis Cassidy, Fergus Cullen and Benedict Schlepper-Connolly who came to the rescue when our drum-hire situation briefly went into tail-spin. And of course a big, big, big thanks to Charles Hayward, Ian Smith and Ishmael Wadada Leo Smith for letting me share in their skill, craft, intelligence, musicality, generosity and sense of play (and their patience with this first-time tour manager): I’ll treasure Charles’ rhythmic travels to the outer reaches of an alternative-universe Caribbean; Ian’s brave counterpoint; and the spiraling, expert stacatto precision of Wadada’s trumpet. Last but not least, thanks to all who came to listen and witness creative music in real-time! Presented with funding from the Music Network Performance and Touring Award, and support from UCC School of Music, Note Productions, the National Concert Hall and the Cork Opera House. 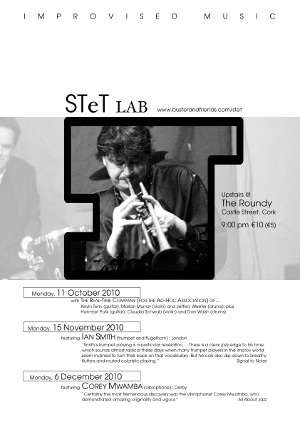 Cork, Ireland 9:00pm (doors: 8:45pm) Stet Lab featuring John Godfrey (guitar) plus The Real-Time Company (for the Ad-Hoc Association) of… Enda Buckley (guitar), Tony O’Connor (bass guitar), Owen Sutton (drums) and Athoulis Tsiopani (keyboard). Scotland 7:30pm Performance by Han-earl Park (guitar) plus Heddy Boubaker (saxophone), Fritz Welch (percussion) and others. Scotland 7:00pm Grind Sight Open Eye presents a performance by Han-earl Park (guitar) plus Heddy Boubaker (saxophone), Fritz Welch (percussion) and others. England 7:00pm An open recording session by Lee Allatson, Han-earl Park, Jamie Smith and the four guys in Black Carrot. England 8:00pm Performance by Charles Hayward (drums), Han-earl Park (guitar) and Ian Smith (trumpet and flugelhorn) plus special guest Lol Coxhill (saxophone). Admission: £5 adv. / £6 on the door. Cork, Ireland 9:00pm (doors: 8:45pm) Stet Lab featuring Juniper Hill (voice) and friends, plus The Real-Time Company (for the Ad-Hoc Association) of… Philip Guiton (guitar), Marian Murray (violin), Claudia Schwab (violin) and Kevin Terry (guitar). Cork, Ireland 8:00pm (doors: 7:45pm) Debut performance by io 0.0.1 beta++ (itself) with Bruce Coates (saxophones), Franziska Schroeder (saxophones) and Han-earl Park (guitar), plus iWife (itself) with John Godfrey (guitar) and Francis Heery (diffusion). Presented with funding from the Music Network Performance and Touring Award, and support from the Arts Council of Ireland, Blackrock Castle Observatory, The Castle Bar and Trattoria and the UCC School of Music. 2010 (TBC) Venue TBC TBC Performance by Han-earl Park (guitar), Mark Sanders (drums) and Franziska Schroeder (saxophones). Interested promoters and venues, please get in touch! Market Harborough, England TBC Performance by Han-earl Park (guitar), Jamie Smith (guitar) and others. England 8:00pm Performance by Charles Hayward (drums), Han-earl Park (guitar) and Ian Smith (trumpet and flugelhorn). Interrupt the usual updates with news of a performance by my students. The Safety First Improvisers are putting on their end of year show. It will feature instances of momentary weirdness, inside and outside, reggae-rock-nuts and a popular Christmas number one. Support by the Dangerous Improvisations Group. Admission is free! Cork, Ireland 1:10pm Performance by Paul Dunmall (bagpipes and saxophone) and Han-earl Park (guitar) as part of the UCC concert series. Cork, Ireland 9:00pm (doors: 8:45pm) Stet Lab’s third birthday! 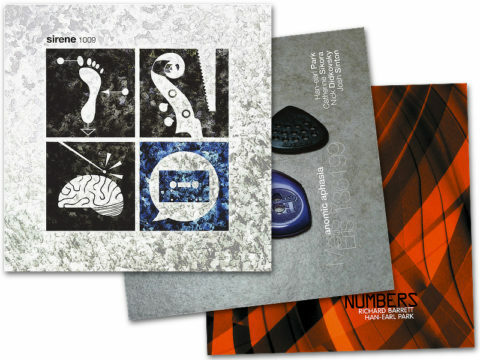 Featuring Filario Farinoppo: Dario Fariello (saxophones, viola, electronics and little instruments), Filippo Giuffrè (guitar and electronics) and Antonio D’Intino (bass, electronics and little instruments). 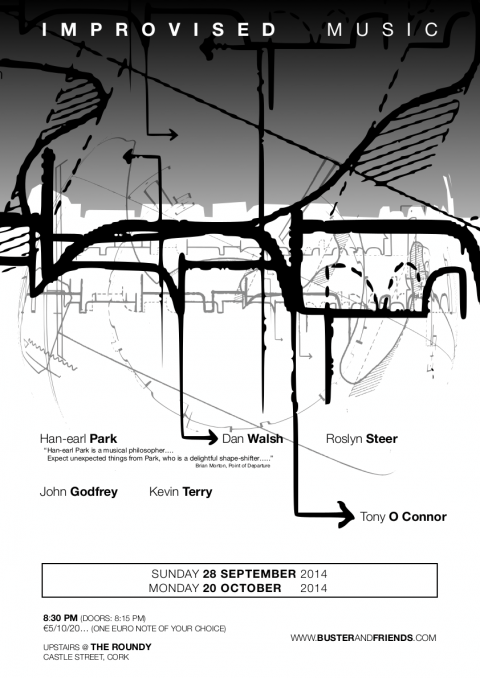 Cork, Ireland TBC Debut performance by io 0.0.1 beta++ (itself) with Bruce Coates (saxophones), Franziska Schroeder (saxophones) and Han-earl Park (guitar). We are seeking further funding and performance opportunities. If you would like to help, please get in touch! Belfast, N. Ireland n/a Recording session by Peter Elsdon (piano), Han-earl Park (guitar), Mark Sanders (drums) and Franziska Schroeder (saxophones). We are seeking sponsorship of this project. If you would like to help, please get in touch!